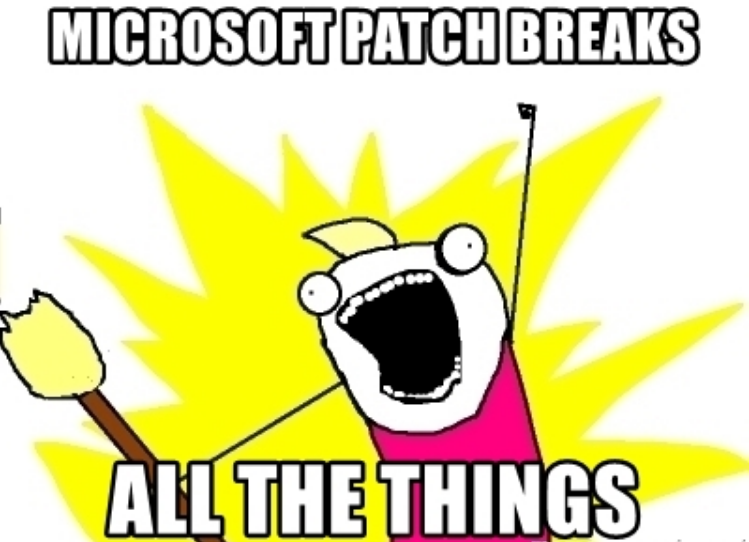 Microsoft Patch Tuesday! 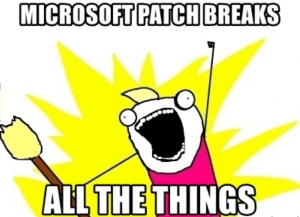 On the second Tuesday of every month, Microsoft issues updates to patch any security vulnerabilities found since the previous month. This month’s update “patched” about 55 security issues in the Internet Explorer and Edge web browsers and Adobe Flash Player, to name a few main programs. The most critical update has to do with the email program, Outlook. A major flaw was discovered in which an infected file could be launched whether from an infected webpage, an email attachment or even an infected link on a website. In other words– with next to no user input required. Although, Microsoft updates it’s own system, it is up to the end user to update all other third-party programs which are installed by them onto their computers. Most notably, you’ll want to be 100% certain that you keep Adobe Reader & Adobe Flashplayer up-to-date. These two programs are constantly breached and patched. Adobe is supposedly going to be killing off Flashplayer this year– we can only hope. So, this update fixed a lot of Windows problems. It also broke quite a few people’s computers. Oops. Numerous posts across multiple websites show comments sections full of those whose systems either lost mouse and keyboard functions, or to failed to boot up at all, after the update was installed. This, has led many to having to reinstall their entire computer– which means that with Windows 10, you’ll also need to reinstall ALL software that was added since first taking it from the box. Windows update breaking things is a long-time issue that causes many Windows users to attempt to turn off updates, altogether. However, with Windows 10, it’s nearly impossible to prevent the offending update from making it’s way back in. It’s extremely bad form- considering that Microsoft has been at this for over thirty-three years? Three decades in technology is like three hundred in any other product line. I can help if the above glitch happens to you. I always suggest using a portable, external hard drive to back-up your data every so often (depending on how often it changes). Additionally, I can create for you a system image of your computer’s entire current configuration for safe-keeping. This makes it much faster to recover to a working machine, in the least amount of time, with all programs intact.